My name is Lloyd Tapp. I am an Ontario Provincial Police officer. I was born in the city of New Delhi, India in January of 1965. I am Indian by birth and the colour of my skin is brown. My father worked for the American Peace Corps and when they were closing offices in India my father immigrated to Canada along with his family. I was eleven years old when I came to Canada and entered the Canadian schooling system in grade 6. Due to my nationality and skin colour I was often the brunt of sarcastic and racial comments from school peers. In an attempt to assimilate to the Canadian culture I worked hard at trying to lose my Indian accent. It did not take me long and I felt I had accomplished this by the time I entered high school for I noticed the racial comments were not as prevalent as in the junior school. I was always fascinated with the police and when I graduated from high school I worked for a couple of years before seeking and obtaining employment with the Toronto Police Service (TPS). My family was proud to see me achieve my goal of being a police officer especially because we were minorities that had come to a new country to make a new living. Not long after joining the TPS I got married. Capable of (through experience) sitting down with an officer, listening to the pertinent details of a call he/she has been to and then preparing a search warrant for a specified premise/location. All through my employment with the Toronto Police Service I was never subjected to any humiliating treatment and neither did I feel I was being discriminated against. I felt at home within the service. The service was extremely multicultural and obviously that had an impact on the unbiased and respectful interaction between the officers. However, that changed when I joined the Ontario Provincial Police. In 2001, I started considering applying to the Ontario Provincial Police (OPP). The OPP had advertised earlier during the year that they were looking for experienced officers. Being that my wife was from the country and along with a growing family I considered the OPP. I felt that the country would be a comfortable and peaceful place to bring up my family. 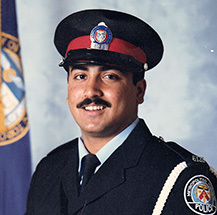 September 30th, 2001, was my last day with the Toronto Police Service. I commenced employment with the OPP on October 1st, 2001. Little did I know what I was going to be experiencing within this large rural organization. My problems with the Ontario Provincial Police date back to 2001, when I was working out of the Cobourg Detachment, which is part of Northumberland OPP. I found the transition from years of policing in the large urban police force of Toronto to the rural policing of the OPP difficult. I was documented negatively about four or five times along with some positive documentation. During my one year probation period I was placed on a special review by my Staff Sergeant. I told them that this was a discriminatory practice since it scrutinized every action of the subject officer in minute detail while a multitude of other officers were committing the same so-called infractions. In an attempt to turn a new page and start afresh I accepted a lateral transfer with a female officer from the OPP detachment in Peterborough County. I was due to start at Peterborough Detachment on the 17th of March, 2003. Little did I know at that time that my Northumberland OPP Staff Sergeant would be taking over as the detachment commander at Peterborough OPP Detachment in 2007. Aside from me there was another visible minority officer at Peterborough Detachment, but due to his tenderness in years of service (less than a year in 2003) he was not about to complain. In mid-February 2003, I attended Peterborough Detachment to meet with the Staff Sergeant to find out which platoon I was going to be on and who my Sergeant was going to be. Walking in, I introduced myself extending my hand for a handshake. He remained sitting behind his desk and just responded in an authoritative voice, ‘So you’re Tapp. Have a seat.’ He went on to tell me how he had just got off the telephone with my Staff Sergeant from Northumberland County. He said the Staff Sergeant had nothing nice to say about me, in fact he said that I was nothing, but a problem. When I tried to say something, he just motioned with his hand extended towards my direction palm up stating that he had heard enough from the Staff Sergeant and that he would be watching me closely. He told me that I would be on ‘A’ platoon and also told me who my Sergeant would be. The whole meeting only lasted about a couple of minutes. I had no idea of the ramifications of my old Staff Sergeant’s (now Inspector) comments to my new Staff Sergeant. He went out of his way to have a telephone conversation with my new Staff Sergeant and poisoned his mind about me thereby poisoning my future work environment. Though I knew this was discrimination and harassment I also knew that it was racial discrimination due to the fact that I was a visible minority. However, I was willing to let it slip by, since I was turning a new page. I thought because of my high work ethics they (the management) would see how I worked, talked, carried myself and the positive rapport that I was able to establish with my colleagues on my platoon would eventually change their opinion of me. Much later I started to see the ramifications. I have been targeted by the Ontario Provincial Police at the Peterborough County OPP Detachment and this targeting has been supported by upper management of the organization’s General Headquarters in Orillia. The OPP carefully orchestrated and manipulated an approach towards me in a variety of scenarios in order to bring me in line with their ideology. The bulk of these incidents were dealt with by my applications to the Human Rights Tribunal of Ontario (HRTO). The Ontario Provincial Police Association (OPPA) refused to deal with my issues indicating that they do not deal with issues under the Human Rights Code (Code). One has to naturally wonder then, what they are good for. I would have to file a complaint with the OPP’s Professional Standards Bureau (PSB). I hung up feeling desperately alone. Ever since the filling of my applications before the HRTO I have been under a slew of investigations under the Police Services Act (PSA). I firmly believe that the OPP flaunts their authority under the PSA and uses it non-sparingly to bring charges against anyone that they believe have committed a violation under the Code of Conduct. It is also a shame that Canada does not allow the Charter of Rights and Freedoms to hold authority over the Police Services Act. By this I mean that I exercised my constitutional rights as a Canadian citizen under section 2(b) of the Charter on the 10th of November, 2008 at the Superior Court of Justice in Peterborough and was convicted for Discreditable Conduct under the Police Services Act. On March the 25th, 2008, I was travelling to a paid duty in Toronto with another officer who was riding shotgun and returned later on that day. On March 31st, 2008, the officer that accompanied me provided a statement to a uniformed Sergeant from the OPP’s pristine Highway Safety Division (that I was a member of albeit a different area) that I was literally flying all the way from the detachment to the paid duty location. After taking her statement the Sergeant travelled to Orillia General Headquarters (GHQ) and met with the Unit Commander of the Highway Safety Division and on April 8th, 2008, charged me with Stunt Driving and Careless Driving. That same day the Sergeant took the cruiser that I used on March 25th, 2008, and calibrated the speedometer. The ensuing news article in the Peterborough Examiner can still be viewed online by entering my name (Lloyd Tapp) on any search bar on the internet. I maintained my innocence and voiced my objection to the false charges in my statement. I was facing possible penal sanctions being that it was two very serious charges under Provincial Law – the Highway Traffic Act. The Charter is worded as such and provides protection for any citizen of Canada when faced with the possibility of any penal sanctions as a result of any Provincial or Federal judicial process. On the day of trial (November 10, 2008), the presiding Justice of the Peace dismissed the charges and had some carefully chosen remarks to say about the case for prosecution. Extremely relieved, but equally upset at having had my whole family dragged through the stress of the false charges and the toll it took on my family, I, upon exiting the courtroom gave a private and poignant interview with a Peterborough Examiner reporter. The newspaper decided to print what I stated with a captivating headline, ‘Racism behind allegation’. Though the headline was most apropos for the circumstances I was experiencing within the OPP, it was viewed as discreditable conduct under the PSA. I was charged and convicted in the OPP’s internal judicial process which is referred to by many officers as a “Kangaroo Court”. Meanwhile my complaints that I filed with the HRTO (five in total) were set for a five day hearing and on day three the OPP and my counsel negotiated a settlement. However, within five days of that settlement I was called into the Inspector’s office and advised that I was being charged under the PSA for certain remarks that I made to a uniformed sergeant on day two of the HRTO hearing at 180 Dundas St. West, (now 655 Bay Street) in Toronto. The OPP abused their authority under the PSA and though I had every right as a Canadian citizen to exercise my right under section 2(b) of the Charter I was barred from doing so under the PSA. In light of everything I was going through, I became very self-conscious and extremely defensive. Colleagues viewed me as an unapproachable individual. My health had already deteriorated and I constantly found myself booking time off for work related stress. I became very depressed and I am currently on medications for various medical conditions. In January 2011, I booked off work with stress. My doctor placed me on a three month leave of absence. The OPP sent me a letter telling me how concerned they were and in order to help them address any needs I may have they wished me to attend one of their Independent Medical Exams. My mistake was agreeing to attend. I felt that being that I had nothing to hide I was willing to see any doctor they wished. But nowhere in their letter did it state that it was with a psychiatrist. They furnished the psychiatrist with false information and even disclosed my record of offences. Consequently that psychiatrist wrote a scathing report that I was not psychologically fit to be a police officer. I had to fight tooth and nail to force my employer to accommodate me and bring me back to work. After the three months my doctor gave me a note to return to work, but on light duties. The OPP refused to allow me to return based on the content of the IME which was prepared by a specialist. Now I had to force myself to see a psychiatrist just to challenge the findings on the IME. Having been forced to attend their IME in November 2013, the OPP got what they wanted. Though the IME was scheduled for one hour the psychiatrist stopped the interview after twenty minutes stating, “OK, I have heard enough, there is no need to go any further.” He wrote in his report that I was not fit to be a police officer, but at the same time in the middle of his report concurred with the prognosis of my psychiatrist about me returning to work on light or modified duties. Upon getting this report the OPP changed my leave of absence without pay to with pay up to December 4, 2013, which is the date they received the IME report and then effective December 5th, 2013, and then changed back to leave of absence without pay. Forced to attend Independent Medical Assessments under the threat that if I did not attend, the OPP would not revert my leave of absence without pay to leave of absence with pay. In March 2014, the OPP sent me an email (email advising me of relocation) advising me that they are handing my file over to the Ontario Public Service for relocation. Though it might seem that they got what they wanted (getting rid of me) I never gave up fighting this dismissal. After enough pestering the OPPA provided me with counsel and after her first communication with the OPP I was told that the OPP is willing to accommodate me. Based on my treatment I believe the OPP is a ruthless organization that pretends to comply with the Human Rights Code, but really does not. I firmly believe the OPP thrives in anonymity and that is why they always wish to settle (when in the Human Rights Tribunal forum) before getting to a hearing or before one is finished. In doing so they cannot be held accountable. To that end I aim to hold them accountable. I encourage any officer who is facing the prospect of having to attend an IME to first contact me lloydtapp65@gmail.com before agreeing. The OPPA will tell you to attend it, but in reality there is nothing in law that compels an employer to request an IME. The OPP uses IMEs as a tool to get what they want and what they want is not always in the best interests of the employee. Having been returned to work in an accommodated capacity the OPP resurrected those old charges from March 2010. The case is entitled Tapp v. Martin and one can look over the decision that is so one sided. I began representing myself in that case and was told by the adjudicator, Superintendent Gregory Walton that my issues that I intended to raise during the hearing had to be in the form of a motion. So I prepared a motion (insert motion) but guess who heard the motion, none other than Superintendent Walton. Not surprisingly the motion was dismissed and guess who adjudicated the hearing, none other than Superintendent Walton. Furthermore, in preparation for that hearing, I gave notice to the Crown pursuant to section 8 of the Statutory Powers and Procedures Act regarding some damaging evidence I intended to introduce about one of their star witnesses. Guess what, not surprisingly I was charged with disobeying a direct order (regarding a July 17, 2015 email from Com. Lewis) and unlawful use of an OPP database for personal reasons. That is another hearing that began in February 2018 and is scheduled to continue sometime in May of this year. Not surprisingly, the adjudicator is Superintendent Lisa Taylor who knows me from my time in the Peterborough detachment and knows of some of the issues I was voicing back in 2003 to 2006. Also interestingly, is the fact that I was out of the workforce from 2011 to 2016 and have no knowledge of that force-wide email from Commissioner Lewis. I firmly believe the OPPA must appeal the decision in the Tapp v Martin case and I do believe they will. Finding it too much to handle I got representation from the OPPA in the Tapp v Martin case but as implied, the whole hearing seemed to be simply one sided. I also believe that Superintendent Taylor, when notified that she was the assigned adjudicator ought to have excused herself from the case on conflict of interest grounds. I now charge the OPP with theft of my wages and everything owing to me from my wrongful dismissal that they say was not the case. However, what is one supposed to make out of an OPP memo that states, ‘… as such your employer is no longer able to return you to any position within the OPS (Ontario Public Service)’. When I say theft I mean that the OPP is deliberately with holding my wages and monies owing between July 2011 and August 31, 2016. Like I said the OPP was forced to take me back October 31, 2016 through the efforts of my counsel appointed tome by the OPPA. My counsel has advised me several times that in negotiating my settlement all she keeps getting from Deputy Commissioner Brad Blair is, ‘I know we owe Tapp a lot of money’ but that has been the saying since the summer of 2016. The reasonable man adapts himself to the world; the unreasonable one persists in trying to adapt the world to himself. Therefore all progress depends on the unreasonable man. George Bernard Shaw.